At Simpl, we use pandas heavily to run a bunch of our machine learning models many of them implemented with scikit-learn. We’ve been growing rapidly and sometime back, one of the models crashed with python’s MemoryError exception. We were pretty sure that the hardware resources are enough to run the task. What is the MemoryError? It’s an exception thrown by interpreter when not enough memory is available for creation of new python objects or for a running operation. The catch here is that, it doesn’t necessarily mean “not enough memory available”. It could also mean that, there are some objects that are still not cleaned up by Garbage Cleaner (GC). 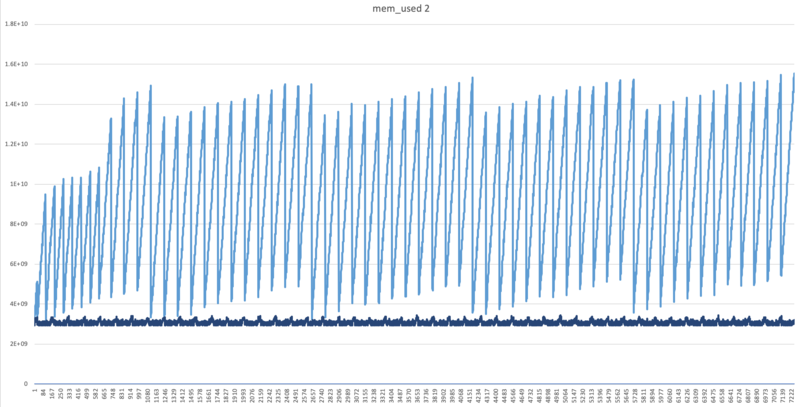 Below is the distribution (Memory usage w.r.t Time) before the program crashed with MemoryError exception. The GC seems to be working fine, but it’s not able to clean up the objects as fast as it’s required in this case. Python’s default implementation is CPython (github) which is implemented in C. The problem was this bug; in the implementation of malloc in glibc (which is GNU’s implementation of C standard library). M_MXFAST is the maximum size of a requested block that is served by using optimized memory containers called fastbins. free() is called when a memory cleanup of allocated space is required; which triggers the trimming of fastbins. Apparently, when malloc() is less than M_MXFAST, free() is not trimming fastbins. But, if we manually call malloc_trim(0) at that point, it should free() up those fastbins as well. Therefore, we need to trigger malloc_trim(0) from our python code written above; which we can easily do using ctypes module. In another solution, I tried forcing the GC using python’s gc module; which gave the results similar to above method. Even after doing low_memory=False while reading a CSV using pandas.read_csv, it crashes with MemoryError exception, even though the CSV is not bigger than the RAM. Explanation of malloc(), calloc(), free(), realloc() deserves a separate post altogether. I’ll post that soon.